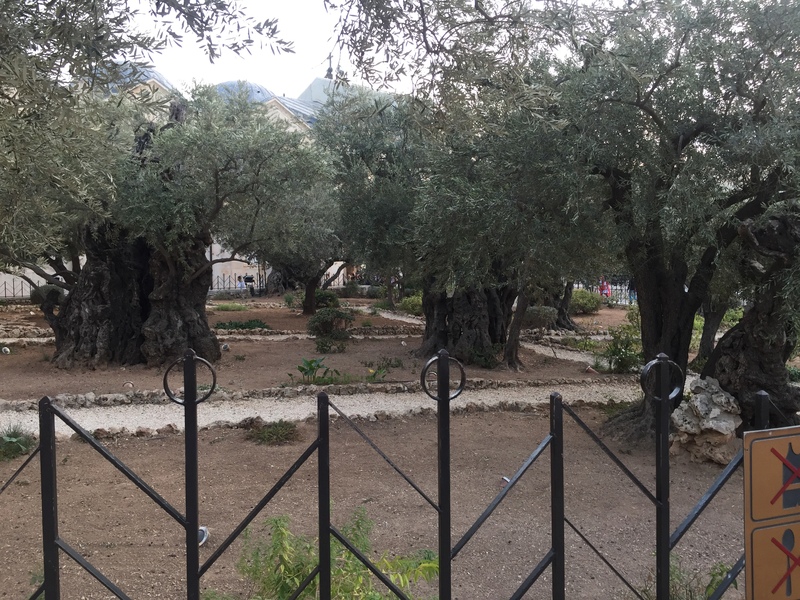 After 28 years of a failed marriage, followed by years of praying for healing with my former husband, I traveled to the garden of Gethsemane (meaning “olive press”) to cry out to the only One who could understand my heartache of abandonment, and rejection. I arrived early morning in Gethsemane on the very day of my former husband’s wedding. (Amazingly, only the gardener was in the garden.) I knew that no one else could even imagine the depth of sorrow I carried in my heart, except Jesus. I wanted so much to meet Him in the place where He was pierced by the pain of those who said they loved Him, but then betrayed and deserted Him. After the gardener walked me into the gated, inner court of the ageless olive trees, and gifted me a precious and priceless seedling, I thanked him profusely for this unique and treasured privilege and then went to sit against a stone wall facing the Garden, to cry. I sobbed for the hearts of my children, and for my heart. When I could cry no more, I then began to read every account in the Bible concerning what Jesus had gone through in that place. As I mediated on the passages and talked with Jesus about them, for the very first time in my life, my tears transformed from an overwhelming sorrow for myself into a very deep sorrow for all that Jesus had suffered, for me. The “fellowship of His sufferings” became the healing balm for my soul and the deepest reason for my compassion for the broken hearts of others. Truly the passionate and profoundly healing words He spoke to me that day can only be heard in gardens like Gethsemane and only by hearts that have experienced the painful “olive presses” of life. 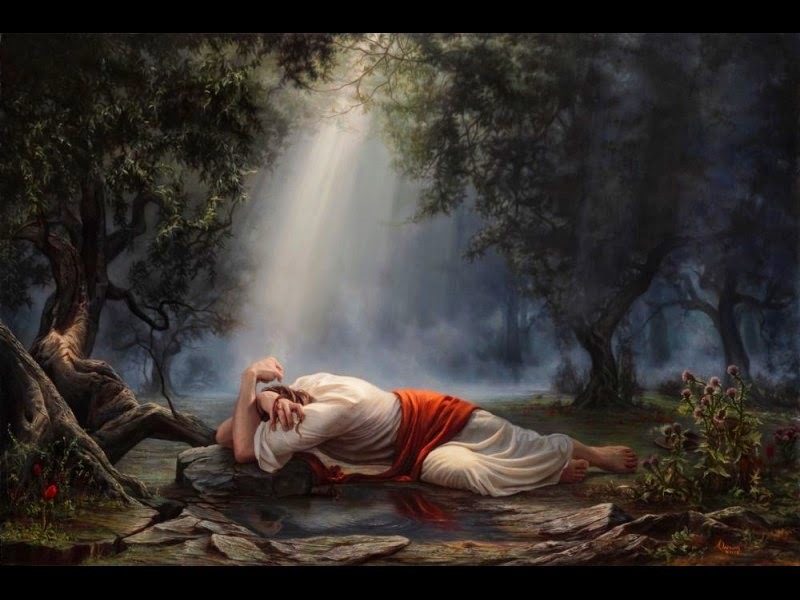 Ever since my marriage had ended and my heart and family had broken into a thousand pieces, I had thought many times about the garden of Gethsemane. I had said so often, “If I ever get to go to Israel, I want most of all to go to Gethsemane. I want to lie down there and cry with Jesus. Only He can understand the pain of abandonment and rejection, because He, too, experienced it.” So at the end of my trip to India, instead of returning to the States, I went to the garden of Gethsemane in Jerusalem. There I experienced profound healing. I use the word “profound” because the healing I experienced in Gethsemane revealed one of the deepest truths about the healing ministry of Jesus I had never before contemplated. When I arrived in Jerusalem, I stayed in a monastery of French-speaking nuns. Their beautiful vespers sang me to sleep each night and gently awakened me in the morning. 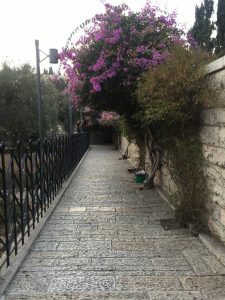 On the day of my husband’s wedding, I took my Bible and walked outside the large stone wall encircling the convent and down to the historic and majestic walls of Old Jerusalem. To avoid getting lost in the city’s narrow and winding streets, I followed the wall outside the Old City. As I walked toward Gethsemane, I contemplated the foreboding gold dome of the mosque on the Temple Mount and sensed the tears falling at the Wailing Wall. 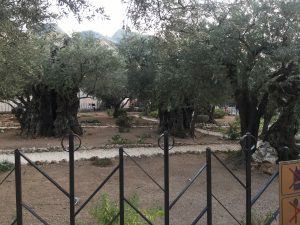 When I arrived at Gethsemane, I was a little early, so as I waited for the gate to open I walked around behind the garden. I noticed abronze plaque on the back stone wall. On it was inscribed the words of Matthew 26: 39: He went a little farther and fell on His face, and prayed, “O My Father, if it is possible, let this cup pass from Me; nevertheless, not as I will, but as You will.” The next sentence on the plaque cut to my heart. “Jesus was able to face His darkest hour when, after much suffering, He surrendered to the will of His Father.” I knew the Lord had shown me that plaque so that I would carry its piercingly relevant words with me into the garden. 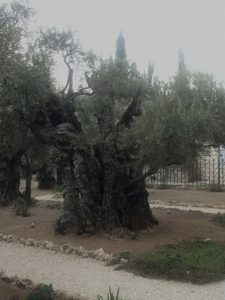 Once inside* I sat down with my back to the stone wall, facing the ageless olive trees, and read all God’s words about Gethsemane in the Gospels (Matthew 26; Mark 14; Luke 22). As I began to pray for the hearts of my children, Kristen and Victoria, a grief came over me that was so strong that I could only lie down and cry. I begged for the Lord’s help to heal and guard their hearts and heal the hearts of our family. “Lord, please help me accept ‘this cup,’ to accept Your perfect will, and to believe Your promise that You will give me a future and a hope” (Jeremiah 29: 11). As I prayed, the Lord’s Spirit brought to mind everything Jesus suffered in Gethsemane. But this time I found myself focusing on how He felt in that place—His deep distress, His soul being “crushed with grief, to the point of death” (Matthew 26: 38 NLT). What agony! And then I meditated on His feelings of abandonment, rejection, and loneliness. Have you ever poured out your heart to a friend, only to have her say, “I understand how you feel?” Did you think to yourself that there was no way she could ever understand the depths of your pain unless she experienced every detail of it? That thought is true. But when we meditate on Jesus’ experience in Gethsemane, described in Matthew 26, we find a friend who truly has experienced all our sorrow. I had read Matthew 26 many times before, but this time, I saw that Jesus had experienced deeper sorrow and pain than I had ever known or would ever know. I saw the rejection Jesus experienced by those He trusted and loved. I saw His abandonment by those who said they would never leave Him. I saw the betrayal by one who walked with Him, dined at His table, and kissed Him. I saw those He trusted lie about Him. I saw Him denied by one who vowed faithfulness until death. Jesus had experienced deeper sorrow and pain than I had ever known. It was then that I realized that Jesus truly knew my sorrows. As I sat in Gethsemane crying for myself, I came face to face with the reality that Jesus cried in that place, for me. And because of that, He was the only one who could intimately understand and care for me—the only one whose arms could comfort me. I could trust Him with my heart. My tears that day began to flow from another well source. For the first time in my life, I grieved for Jesus. My heart broke as Jesus spoke this truth into my mind: “My suffering in Gethsemane was for you, Loren, so that you would not have to live in the Gethsemane of your soul.” Then I thought of the passion of Christ for me in Isaiah 53: 3–5 (NLT): He was despised and rejected—a Man of sorrows, acquainted with deepest grief … Yet it was our weaknesses He carried: it was our sorrows that weighed Him down … He was beaten so we could be whole. He was whipped so we could be healed. I no longer had to suffer alone; nor would I have to suffer for endless years. With resurrection power, Jesus set me free from my suffering just as He had set me free from my sinfulness—my selfishness. Note: The above account in, When Jesus Answers, does not contain any reference to my encounter with the gardener in Gethsemane as it was written about 10 years ago when I was very naive about angels and manifestations of Jesus. Please be assured it will certainly be included in the book’s next edition! I was divorced 33 years ago. I’m still sorry it happened but Jesus has taken on the role of my husband. I too have two daughters from our marriage. My former husband has been married three other times and his current wife won’t allow his daughters to come to their home. Nevertheless, they still love him and accept the relationship that remains. Virginia, This post just appeared. I don’t know what happened. I am sorry for the late reply. I am so glad to hear that Jesus has become the lover of your soul and your husband (Isaiah 54:5). You are so blessed as many people never arrive at that place of understanding that they were created for a love much deeper than human love. I hope my book blesses you with a message of healing and intimacy found only in the arms of Jesus.